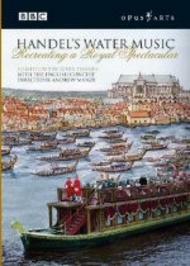 The renowned London biographer Peter Ackroyd narrates the ambitious attempt of a team of historical experts to discover the remarkable story behind the 1717 premiere of Handel�s Water Music on the Thames. The result is the second-ever performance on the river, filmed in costume on a regal-style period barge against the backdrop of the present-day Thames from Whitehall to Chelsea. Plus: The 1717 London Panorama by artist Stephen Conlin - Follow the river route as it would have looked in 1717 while listening to the music, in a special multi-angle performance version featuring an historic-style panoramic view, illustrated by Stephen Conlin and exclusive to this DVD. The panorama seeks to combine the available information to evoke that evening on the Thames; landmarks that differ from today include Westminster Abbey without the famous west towers, St John�s, Smith Square as yet unfinished, and the complete absence of both Big Ben and Westminster Bridge. By contrast, the Royal Hospital in Chelsea is much as Wren left it, and instantly recognisable.